High Quality, handmade hemp paper manufactured using a 2000 years old paper making technique. Base materials are 50% hemp with the remainder linen and cotton. Paper is acid free and meets archival standards. 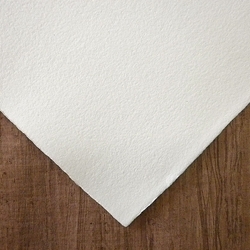 These large sheets have a natural deckle edge. Sheets are hand made so please allow for slight color deviations. Usable for Handwriting, Calligraphy, Inkjet Printing, Water Color, Pastel and Charcoal.